How do you make an established ad campaign feel like a new ad campaign? 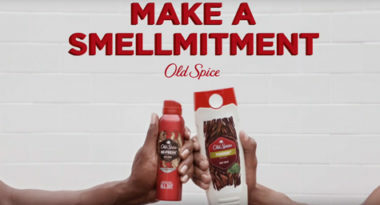 Procter & Gamble’s Old Spice brand showed marketers how to pull this a few years ago with it’s “Smellmitment” offering. The campaign united its two iconic brand spokesmen, Terry Crews and Isaiah Mustafa, for the very first time. The result was pitch-perfect marketing that both connected with existing and new audiences. Crews and Mustafa were more than mere spokesmen for the brand. These former NFL players portrayed popular eccentric characters in their prior ads for Old Spice. Their distinctive characters were named for specific scents, which were among the brand’s most popular. Crews and Mustafa were credited with breathing new life into the brand and their familiar faces created continuity. The new ads continued Old Spice’s tradition of comical campaigns but added a new twist: consumers were asked to commit to their favorite scent and express their personal “Smellmitment.” Crews embodied the Bearglove scent with his Bearglove Man, while Mustafa represented the Swagger and Timber scents with his portrayals of Swagger Man and Timber Man. Each argued for scent superiority, while also showing how variety is the spice of life, as well as the Old Spice brand. This competition element made the campaign feel fresh and compelling. The campaign was developed by Wieden+Kennedy (you can see some smart behind-the-scenes footage here) and included TV, print advertising, digital advertising, social media marketing, and POP. The TV advertising effort featured a series of seven spots throughout the NFL season. MDG Advertising is a full-service advertising agency and one of Florida’s top branding firms. With offices in Boca Raton and New York City, MDG’s core capabilities include branding, logo design, print advertising, digital advertising, online advertising, mobile advertising, email marketing, media planning and buying, TV and radio, outdoor advertising, newspaper, video marketing, website design and development, content marketing, blog development, social media marketing, and SEO. To discover the latest trends in advertising and branding, contact MDG Advertising today at 561-338-7797.